How Big is the Print Industry? Big. Really Really BIG! With digital media being such a large part of our lives it’s hard to remember how BIG the printing industry really is. The truth is that print is all around us all of the time. From the clothes we wear to the food we buy and even the art that we hang on our walls. Print plays such a central role in our lives. I would even go as far as to say that print is a part of what makes up the foundation of our society as we know it. We often take it for granted, but if you think about it print touches just about everything. Without it, brands would have little distinction on the shelves; people would lack individuality; ideas, libraries, culture, history would be expunged from the heart of humanity. Without print our entire society would come to a complete standstill and, perhaps, even crumble. We must consider these facts before deciding to enter into the channels of greenwashing and spouting off anti-print garble. Consider first, what would the world look like without print? A recent study shared by Two Sides NA reveals: “The US mailing industry provides 8.7 million jobs and $1.1 trillion in sales revenue. The production, distribution and handling of mail (including paper and printing) accounts for over 2 million jobs and over $260 million in sales revenue” (read more). Without print, the USPS would go out of business. Millions of people would lose their jobs. Not just people in the mailing industry, but people in manufacturing, paper, printing, and packaging as well as designers, advertisers, software developers, publishers, writers, journalists, marketers, and the list goes on. The loss of jobs would trickle into other careers, including the education sectors. Loss of jobs in retail would be a growing concern because there would be no way for businesses to distinguish themselves. Options in the grocery store would be eliminated, companies would continue to go out of business resulting in millions more of jobs lost. In the U.S alone, it would be equivalent to the stock market crash (or worse). Worldwide, it would catastrophic. As mentioned in the last section, without print and packaging, brands would lose their ability to communicate their individual brand messages; however, that is not the only communication that would be lost. Consider: road signs, maps, and warnings ahead. The lack of print in society is dangerous in more ways than you may realize. It’s not only how brands communicate with their customers, but how people communicate with one another as well. The concept of media itself stems from print. Even the most respected online journals and news sources originated from print media and communications. Our entire digital world stems from the very foundations that print communication has laid out for it. Not only would millions of people lose their, but communication as we know it would be lost. Marcus Tullius Cicero once said, “’A room without books is like a body without a soul.” Without print the world would be bleak to say the least. There would be little to no means of brand expression. There would be no libraries, no bookstores, magazines, newspapers, and photos to hang on our walls. There would be no mail. There would be far less advancements in technology, less forest management. An article put out by Scodix titled Luxurious Packaging in the Digital Age explains that consumers desire product-packaging that affects the senses. They crave the experience that product manufacturers offer them through special effects such as cold foil. It is what makes life interesting. Without it, it would be a white, bleak, boring world. So there we have it. The next time you hear someone challenge print, rather it be from an environmental perspective or from the mindset that digital is bigger, kindly remind them that without print the world would be a very different place—a place that I personally want no part of. Lucky for me and everyone else, print is far from dead and in fact due to new and innovative technology such as we see coming from companies like Highcon and Landa Nano, it grows stronger every day. Jennifer Grace is a freelance marketer who helps companies achieve results through strategic business development, content creation, and social media marketing. She is a writer, photographer, and lover of print. Her extensive experience in print sales and marketing helps printers authentically connect with their customers, prospects, and millennials. 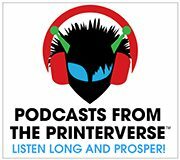 Jen is a contributor to Print Media Centr’s News From The Printerverse, and a regular at #PrintChat Wednesday’s at 4PM ET on Twitter.